The pergola is up! Making it beautiful, colourful, romantic and heavenly is the exciting part. Well-planned pergola planting can do just that. 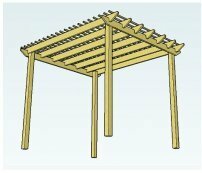 Bring your pergola to life! 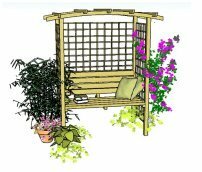 Of course, using climbing plants is the obvious way to go, (and there's lots of info here to get you started), but there are other plants that can be used really effectively to make your pergola very special. Today, because I've had many questions about how to keep these plants blooming, we are going to look at how to use hydrangeas to their full potential - the short and the tall - and get the best flowers possible. Hydrangeas, although not one of the first plants that come to mind when thinking of a pergola, are well suited to bring beauty and vibrancy in nearby borders and patios. Which one is my favourite? Well, it has to be the lacecap, the form is so stunning. But all work well near a pergola or seated arbour. There are three main types, each of which can be put to good use inside or around a pergola in pots, tubs or in the ground. Two of our three are macrophyllas - the mopheads and lacecaps we see so often in either blue, pink or white in people's front gardens. Why are some blue and some pink? Blue heads flower on acid soils, pink on alkaline. To make pink ones blue, make the soil more acidic or add a colourant that colours the petals. Mopheads are round balls of blousyness, whereas lacecaps are delicate and flat with the flowers around the edge. Plant these in your border next to the pergola, either grouping with other potted plants for an informal style, or in a tub on the patio as a statement piece - in single colours for a striking modern feel. Keep the soil moist to ensure a healthy plant, preferably placing it out of the full sun if planted in a pot. These can be big plants, some reaching 10ft tall! 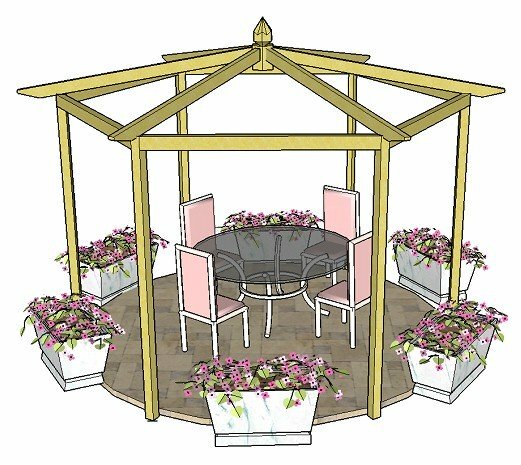 They will frame the sides of your pergola or seated arbour beautifully, and add boldness and simplicity to the planting scheme. The large multi-petalled blooms arch outwards, giving a lovely line against the straight posts. Pruning can make all the difference to how well hydrangeas flower. 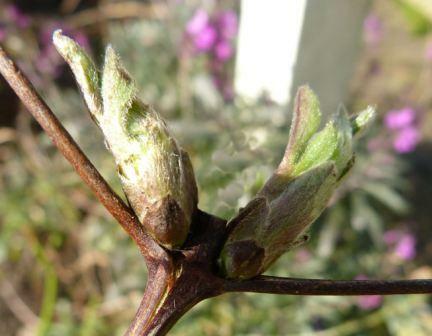 Prune macrophyllas in mid-spring, so that the old, dry flower heads protect the new buds during the winter, and paniculatas in early-spring before the delicate buds start to form. All hydrangeas need week, thin and crossed stems cutting out when pruning, as do most plants. For macrophyllas, cut out a couple of the oldest stems to the base at this time, too. The other stems need to be cut back by about 1ft to a pair of fat buds, as these will produce the flowering shoots. This is an important point - macrophyllas flower on last year's growth. Cut last year's stems off and there will be no flowers. Paniculatas, on the other hand, flower in late summer on this season's growth, so cut down to a low framework of about 1ft from the ground in the front border, or 2ft if the plant stands at the back. All hydrangeas have an opposite leaf pattern, like that of the clematis in the picture below. Use a sharp pair of secateurs as close to the buds without damaging them. Damaged buds = no flowers. For hydrangeas to flower beautifully, they need to be in moist yet well-drained soil, with a good amount of humus in the soil (that's soft bits of organic matter that feed your plants and keep the soil open-textured). You can buy composted manure and bagged compost, or make your own from leaves, kitchen and garden waste. Moisture is a key feature here, and not letting your plant dry out, especially when in pots. Semi-shade is far preferable to full sun. So whether you're planting in pots or in the border, prune carefully, feed the soil and keep it moist. 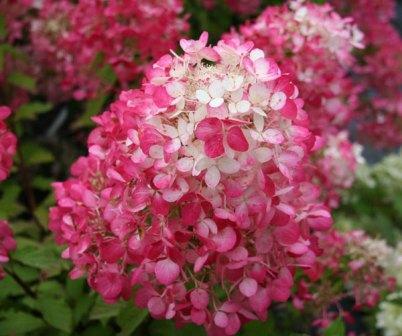 Your hydrangea will reward you with a fabulous show! 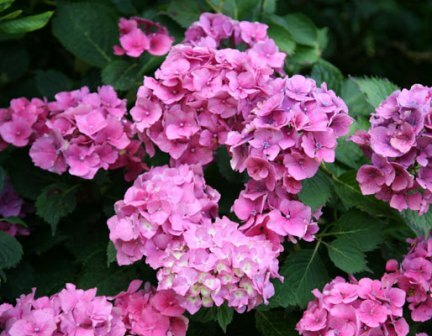 Buy hydrangeas here and find more care and pruning information for these specific hydrangeas. Just look at the stunning colours! 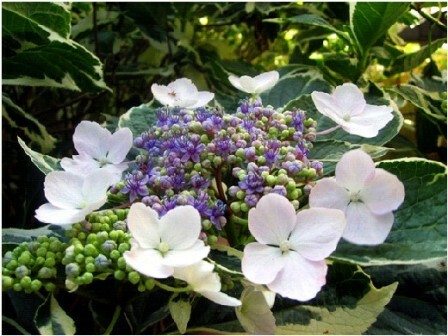 If you would like more help on specific pruning and training, an excellent source of information for all types of plants is the book RHS - Pruning and Training (includes how to prune your hydrangea), which has clear diagrams to show you exactly what to do.